The ACM Siggraph conference starts tomorrow, August 10th, in Vancouver, BC. Multithreading for visual effects coupled with massive parallelism has changed the visual effects industry forever. 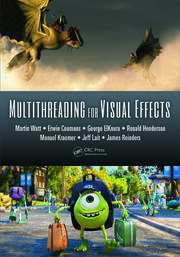 A new book capturing that trend titled, appropriately enough, “Multithreading for Visual Effects”, is an excellent source of information about how visual effects are currently performed at industry giants such as Pixar and DreamWorks. Key parallelization options discussed include: (1) TBB (Intel Thread Building Blocks), (2) The Clik Plus C/C++ extensions for fine-grained parallel programming, (3) OpenMP, (4) OpenCL, and (5) GPU-specific models. Contributing authors include Martin Watt from DreamWorks, Erwin Coumans (Bullet Physics and Google), George ElKoura (Pixar), Ronald Henderson (DreamWorks). and James Reinders (Intel). The book is based on the Siggraph 2013 “Multithreading and VFX” course notes. ACM subscribers can read and see the ACM course notes: PDF, Mp4 Mp4 Part 1 Mp4 Part 2 Mp4 Part 3. Expect lots of eyecandy at the show!